Following highly emotional reactions, the British and EU27 governments now face two negotiations. First come the divorce proceedings, which will start when Britain invokes Article 50 (by the end of March 2017) and are required to not exceed two years. Second, they will have to negotiate under Article 218 on all aspects of the future relationship between the UK and the EU as a whole. These negotiations will be hugely complex because, one way or another, the UK – or what remains of it – will continue to be deeply integrated with its former EU partners. Hundreds of thousands of detailed pieces of legislation will be on the table. From the EU27 side, the task is doubly complicated. Each government must decide what it wants and what it could be ready to concede. Then all 27 governments and the European Parliament must negotiate among themselves what their collective position will be for the negotiations with the UK. The eBook focuses on economic issues and on the negotiating positions of the EU27 countries (Wyplosz 2016).1 I have asked leading economists from a large number of countries what, in their view, their own country’s strategy should be. The objective is not to dwell on the millions of thorny detailed issues that will come up, but instead to focus on the big picture. Unsurprisingly, the responses are diverse. The British market is very important for some (usually small) countries, but much less so for the others. The stakes, therefore, are not the same. British exports to many countries are negligible or small for the UK. This would seem to suggest that the UK will not be very concerned by a trade agreement. In fact, as a whole, the EU27 absorb about half of British exports, while the UK is a relatively small market for the EU27. Another consideration is that Britain tends to import industrial goods and to export services. Should the final agreement treat the UK as just another country, WTO rules would apply by default. These rules imply heavy tariffs for traditional industries, including agro-industrial products, which could hit some countries hard. Since the Ricardian model of trade is relevant in many instances, income redistribution is an important factor. For many smaller countries, foreign direct investment (FDI) is negligible in both directions. In some others, though, it is very important and usually both ways, especially for Luxembourg, Ireland and the Netherlands. Part of these flows may relate to tax optimisation, which stands to divide the EU27 countries. Another part, though, reflects value chain trade. For some of the largest countries (France, Germany, Spain), FDI from Britain largely exceeds FDI to Britain, suggesting that British firms subcontract production to these countries. Keeping these flows open may well be an important objective for the EU27. It is well understood that a key objective for the UK will be to maintain the supremacy of the City of London. Passporting rights, which allow financial institutions registered in one country to operate in all other EU countries, are the key element. Eliminating British passporting rights may be tempting for some large countries (France, Germany, Italy) that consider that scale matters and that they stand to host some of the business that the City would lose (McMahon 2016). Some smaller countries (Ireland, Luxembourg and the Netherlands) also expect to benefit from an end to British passporting rights given well established links to the City and a tradition of providing international financial services. However, if scale matters, we should expect much of the City’s business to migrate to just one place, not to be scattered among many countries. There is ample room for intra-EU27 conflict. Free labour mobility and the ban on discrimination against foreign nationals hailing from the EU constitute one of the four freedoms that – along with the mobility of goods, services and capital – are considered a fundamental pillar of the EU. Prime Minister Theresa May considers that opposition to this freedom has played a critical role in the Brexit referendum and that her government is now duty-bound to reject this obligation, one way or another. Among the EU27, many countries refuse to even consider any limitation to the principle of free labour mobility. At this level, there is no room for negotiation. Digging deeper, however, reveals a more complicated picture. Some countries are net receivers of EU migrants, others net issuers. Furthermore, immigrants can come from the EU or from the rest of the world and the mix is very different from one country to another. It might seem that Brexit only concerns intra-EU migration, but then comes the Schengen agreement. Once they are registered in any EU country, people are free to move to any other EU country, except Ireland and the UK since these two countries have an opt-out from the Schengen agreement. Interestingly, a significant number of British citizens live in EU27 countries where they contribute to economic activity as workers or retirees. In addition, tourists from the UK are conspicuous, chiefly in many Southern European countries but also elsewhere. A few contributors also mention the crucial importance of student mobility, noting that British universities attract many foreign nationals (Austria, Finland, Slovakia). The positions taken by the contributors reflect these contradictory aspects. They all recognise that labour mobility is a make-or-break issue. Most of them consider that it is simply non-negotiable, as a matter of principle. The countries from Central and Eastern Europe are also extremely keen to preserve the rights of the large numbers of their citizens who live in the UK. However, a few contributors call for a more pragmatic approach and suggest various temporary opt-out clauses (Austria, Greece, Sweden).2 Furthermore, migration, it is sometimes noted, is a live issue in many countries and domestic political considerations may well interfere with the negotiations. The case of Switzerland, already involved in similar negotiations, is examined. In his contribution on Belgium, Paul de Grauwe focuses on the vocal British rejection of the legal supremacy of the European Court of Justice, including in matters concerning the four freedoms. It is argued that this issue cannot be separated from the Single Market since it ultimately settles relevant disputes. Experience with the European Economic Association and EFTA confirms that the issue is real and serious. This may well be another make-or-break issue. Many contributors note that historical links with Britain stand to affect their countries approaches to the negotiations. This concerns Greece, Portugal, Ireland, the Northern countries, as well as the Central and Eastern European countries. Politics also matter, of course, including the relationship with NATO and fears over Russia. Even the case of Gibraltar will greatly matter for Spain. On the other side, de Grauwe considers that historically Britain always has endeavoured to limit the power of the continent and will want to use the negotiations to further this goal. Other contributions note the role played by the UK in the EU in promoting a liberal economic order in Europe (Finland, Slovakia, Sweden). They express concern that Brexit will leave their countries in a weaker position as the largest countries could challenge this order. The Visegrad countries, which feel dominated by the core members of the EU, worry that the departure of the UK, seen as a natural ally, will make their position more difficult. The UK has been a net contributor to the EU budget, which means that its withdrawal will reduce net transfers to a number of countries. Unsurprisingly, the countries that are net recipient of EU funds (Greece, Poland, Slovakia) worry about the implications of Brexit (as well as Austria, a net donor), and most contributions from the largest countries do not even consider payments to the EU to be an important issue. Conclusions: what kind of Brexit? Much of the current public debate contrasts a ‘hard’ with a ‘soft’ Brexit. The British government has stated that it seeks a hard Brexit, meaning a complete withdrawal from the web of links that are binding it to the EU. Many EU27 governments have also publicly signalled a preference for a hard Brexit. This could be just a negotiation strategy. Starting from a clean slate instantly frees the UK from all its previous commitments and puts the focus on what it wishes (“Brexit means Brexit”). From the EU27 standpoint, a hard Brexit establishes that the UK cannot expect any preferential treatment relative to any other non-EU country (“out is out”). Thus each side of the negotiating table starts from far out, presumably hoping to force the other side to walk more than half of the way. It could also be a matter of principle. Many countries consider that international agreements built up over decades cannot be revisited, especially if it would encourage other countries to seek special arrangements, a process that could unravel the EU as we know it. Domestic politics also matter at a time when Eurosceptic political parties are on the rise, and sometimes even form part of a governing coalition. Pro-European governments are keen to make Brexit very painful for the UK if only to demonstrate to their electorates that Euroscepticism is a dead end. In addition, a variety of vested interests, which may calculate that they stand to benefit from a hard Brexit, may influence governments. Whatever the motivation, a large number of contributors support a hard Brexit. The list includes those writing about Belgium, Finland, Germany, Italy, Hungary and, possibly, the Netherlands. Other contributors resent the strategy, which they see as a sort of Nash equilibrium that contradicts the usual welfare results from trade theory and practice. They favour instead a soft Brexit. The list includes contributors from Greece, Portugal, Spain and Sweden. The remaining contributors do not take a firm stand, adopting a more nuanced, case-by-case view. The table below summarises this diversity of opinions. At the risk of oversimplification, the first three columns present my own interpretation of the contributor’s views on how flexible their countries are willing to be on the three core issues of trade, FDI and labour mobility. The fourth column indicates when the contribution mentions kinship with the UK on promoting a liberal economic order and the last columns does the same for concerns about the loss of the British contribution to the EU budget. 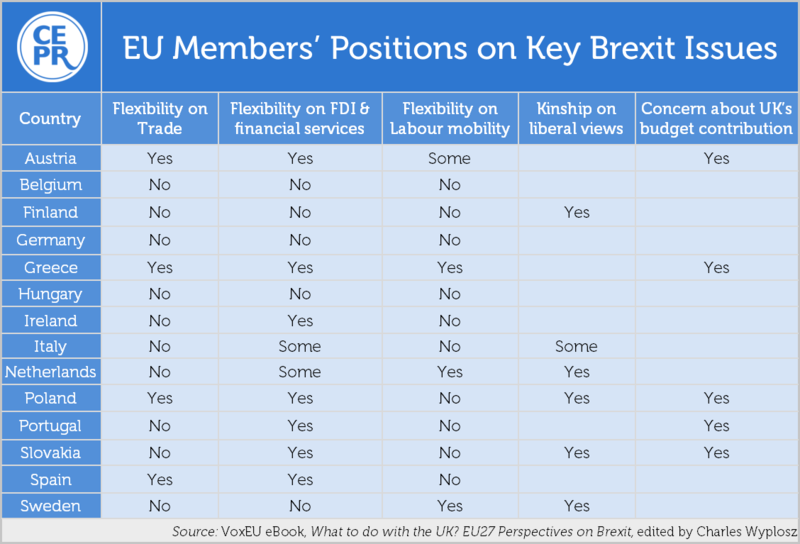 Beyond the lack of unanimity, the table shows that the countries that share the UK’s liberal economic order orientation are typically more prone to display some flexibility on the Single Market rule, especially when they are also concerned about the British contribution to the EU budget. Source: Own interpretation of contributions to What To Do With the UK? EU perspectives on Brexit. As a summary, this column focuses on the broader issues, simplifies and ignores nuances. The diversity of views reminds us that the final agreement will have to be approved unanimously by the 27 member countries and also by the European Parliament. In principle, disagreements favour the status quo. Baldwin, R (ed.) (2016) Brexit Beckons: Thinking ahead by leading economists, CEPR Press. McMahon, M (2016) “The Implications of Brexit for the City”, VoxEU.org, 10 August. Pisani-Ferry, J, N Röttgen, A Sapir, P Tucker and G B Wolff (2016) “Europe after Brexit: A proposal for a Continental Partnership”, Bruegel. Wyplosz, C (2016), What To Do With the UK? EU perspectives on Brexit, CEPR Press. Baldwin (2016) covers many similar issues from the UK standpoint. Pisani-Ferry et al. (2016) develop a related Continental Partnership proposal.